While Albania may have gone from a virtually unknown land to a well-established stop on the Balkan backpacker trail in barely a decade, its interior remains little known. 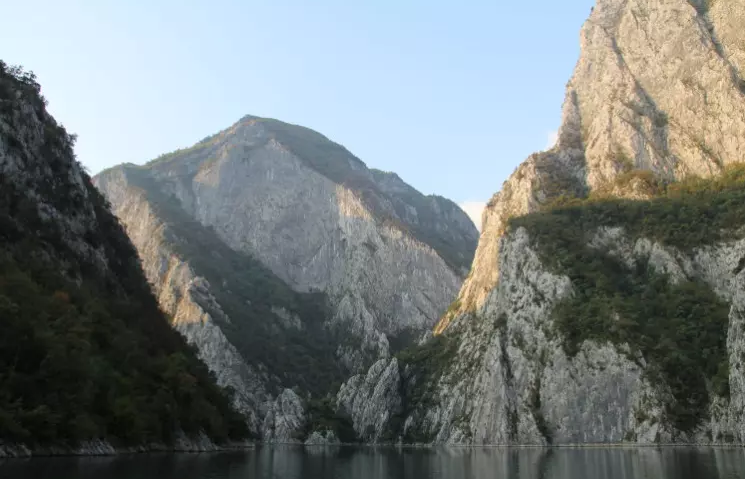 But a popular three-day round trip that combines a spectacular ferry ride and a fantastic day hike between two remote mountain hamlets has put northern Albania’s mysterious highlands on the map. The minibus hurtles out of Shkodra shortly after dawn, carrying an incongruous crew of locals laden with bags full of purchases and backpackers keeping their luggage to a very necessary minimum, all heading together for the Koman Ferry. To call the boats that leave the makeshift dock each morning ‘ferries’ might be rather overstating the case, though. 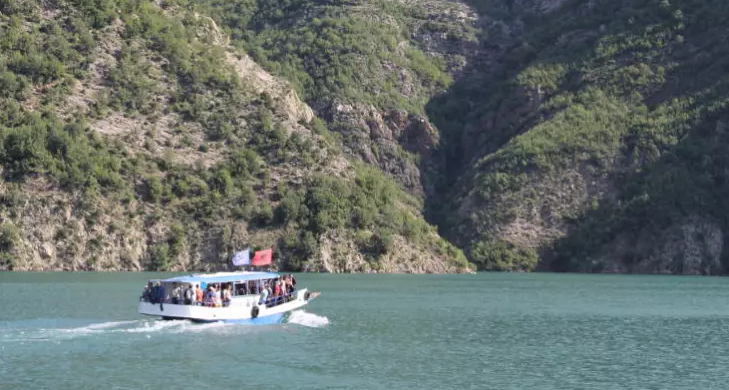 The two distinctly flimsy craft that conduct people through the mountains along the vast man-made Lake Koman – a 1970s electrification pet project of Albania’s former dictator Enver Hoxha – barely look seaworthy. 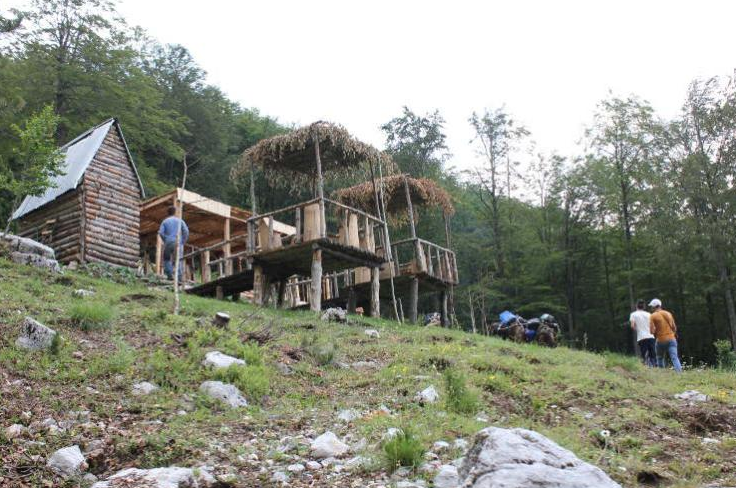 What they do offer, however, are spectacular views of the craggy limestone gorges and thickly forested mountains, as well as a fascinating glimpse into the lives of the hardy people who call them home. It’s immediately apparent from their size and impenetrability why the Albanian Alps are more commonly known to locals as Bjeshkët e Namuna, or ‘the Accursed Mountains’. Of the two ferries that run the route, the Dragobia has been plying these waters for years, while the newer and far more tourist-oriented Annika is a recent addition. A local entrepreneur saw the tourist potential of the ferry route, which until a few years ago was just a lifeline connecting those living in these remote highlands to the rest of the country. Rather ironically, the Albanians tend to go for the newer, more comfortable boat, while most backpackers opt for the more basic choice, perhaps in pursuit of the authentic lake-crossing experience. Authentic it certainly is – the boat stops at the most unlikely spots along the lake to pick up or let off residents who appear almost magically from the thick undergrowth as the ferry pulls up. Very few houses are visible, and most who get off have long walks to their isolated farms ahead of them as the boat continues its methodical journey from point to point through the Tolkeinesque gorges. So remote is it here that it’s one of the few places in Albania not covered by the country’s now iconic bunkers (their construction became an obsession for the communist government, convinced that invasion was always imminent). It is, by any reckoning, one of the most impressive boat trips in Europe, and at €5 a ticket, it’s an incredible bargain still. The journey through to the small port town of Fierzë takes three hours, during which the shy locals smoke and watch with evident pride as backpackers wander the narrow prow of the boat taking photographs. On arrival more minibuses – the workhorse of Albania – are there to convey us to Valbona, which is reached via a succession of twisting, unsurfaced roads that run alongside rushing mountain rivers. Nearly everyone gets off at the Rilindja Hotel, home to backpacker legend Catherine. An American who has made the mountains her home, Catherine is a voluble one-person tourist information service for Valbona, and travellers wait patiently for her to dispense hiking advice from the tables of the hotel’s restaurant. The friendly lodge she runs also tends to be first choice for hikers overnighting here before heading over the mountains towards Theth. 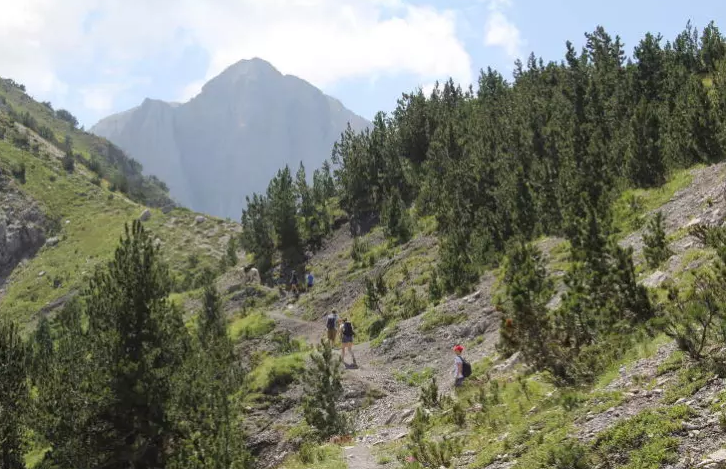 The walk to Theth is an absolutely gorgeous day hike, which takes you through a wide valley, and up a steep ascent to the Valbona Pass (1759m) before a descent through thick forest into the Theth Valley. The views throughout are spectacular, and there are even a couple of small cafes en route, where you can stop for cold drinks in the sun and to enjoy your packed lunch. Arrival in Theth is a relief from the midday summer heat. 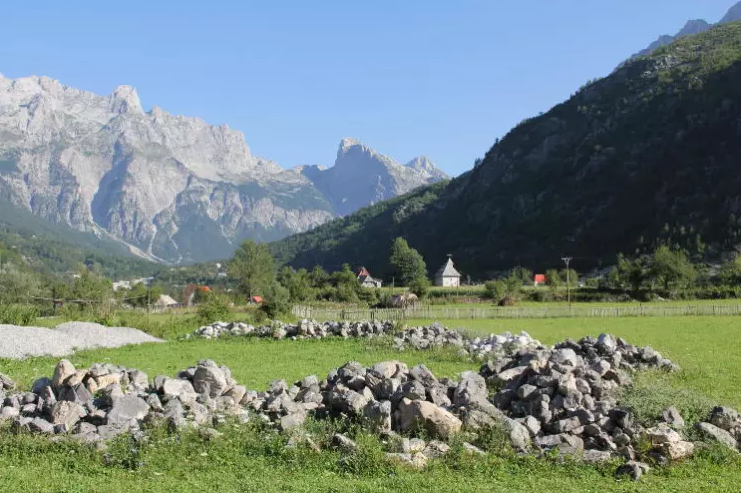 Unlike more recently developed Valbona, this settlement is clearly ancient, with dozens of fine Ottoman-era homes dotting its spectacular setting: the wild Theth River running through it and a prominent stone church at its entrance. Village children greet walkers emerging from the mountainside and try to cajole them into coming to stay at their houses. There’s no denying it: development is coming, with now over a dozen homestay options. So far, so traditional – until at around 7pm the loudest Europop imaginable starts up next door, and the blissful quiet of this mountain village is shattered. Tonight being Saturday, we learn, it’s the weekly village disco, and there is literally no escape. Luckily for us, since this is a remote Albanian mountain hamlet, the music is turned off at 10pm and Theth returns to its habitual silence. Breakfast is served outside in the morning cold. While we wait for the sunshine that creeps across the valley floor to reach the table, we’re served strong coffee, fried donuts and locally made honey before our departure back down to the lowlands. Yet another minibus collects us and several other backpackers, and we begin the torturously slow journey back down from the highlands to the coastal plain. After an hour or so of hairpin bends, pot holes and disintegrating unsurfaced road, we meet a road gang paving the track. The long-awaited upgrade will cut the journey time to Shkodra to under two hours. It won’t be long until the road runs the entire way to Theth, bringing modern Albania right to the heart of the highlands. Make this trip sooner rather than later to enjoy the so-called Accursed Mountains in all their isolated glory. The best way to experience the journey is to take a three-day/two-night loop beginning and ending in Shkodra, and taking in Koman, Fierzë, Valbona and Theth. The morning 6.30am furgon (shared minibus) from Shkodra to Koman (500 lekë, two hours) can pick you up at your HOTEL AND get you to the departure point for the boats by 8.30am. There are two ferries daily in summer – both leave from Koman at 9am and arrive in Fierzë around 1pm. On arrival in Fierzë the boats are met by furgons that will take you to Valbona (400 lekë, one hour). 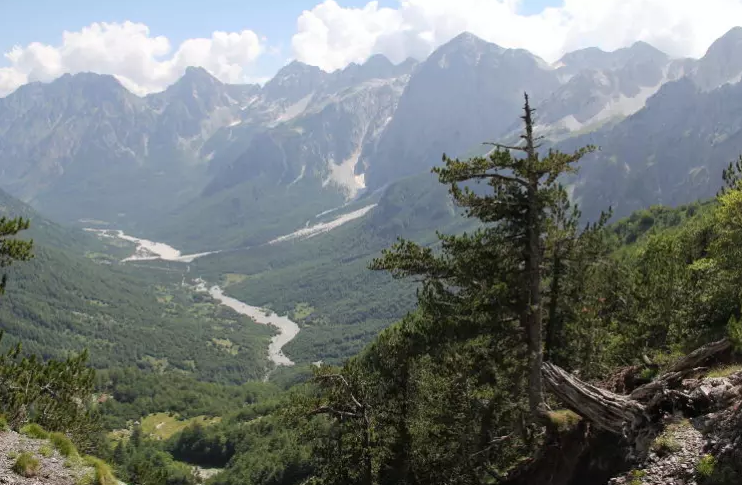 The Valbona–Theth hike takes roughly five to six hours. It’s worth getting a lift to the trailhead (a couple of kilometres beyond Valbona) as it’s a tiring and monotonous walk over a dry stone riverbed otherwise. The trail is decently marked, with a couple of places to stop on the way for food and drinks. It’s easy to hire a mule in Valbona to carry your bags if you’re carrying significant weight. It's also possible (though not really necessary) to hire a guide for the route. 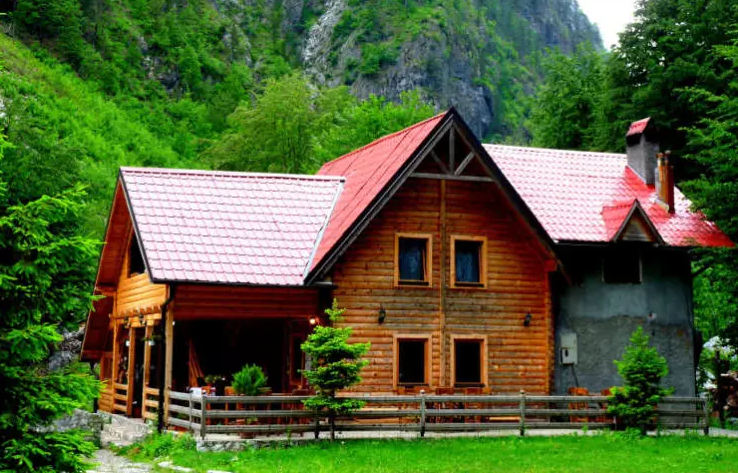 You can overnight in both Valbona and Theth; from Theth take the afternoon furgon leaving between 1pm and 2pm (1000 lekë, three to four hours) back to Shkodra.